SStS partners with International Peace Initiatives on projects that help sustain a home for economic and AIDS orphans. 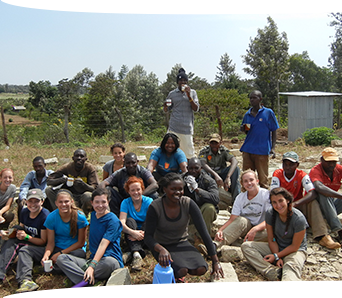 The SStS Kenya course is centered primarily in a village outside Meru, a rapidly expanding town in the foothills of 17,000-foot Mount Kenya. After spending the first day visiting an elephant orphanage and a giraffe preserve in the Nairobi area, the group will travel to Meru to begin its work with our non-profit partner, International Peace Initiatives (IPI). The project work primarily focuses on supporting IPI’s efforts to build and sustain the Kithoka Amani Community Home. This home allows economic and AIDS orphans to remain close to their extended families while also providing them with a safe and healthy home environment. In addition to attending local schools, the children living in the Amani Home work on adjacent organic farms and tend to goats, chickens, and cows. In the process, they help to take care of themselves and learn invaluable vocational skills that will be essential to their success as Kenyan adults. While in Kenya, the SStS group will stay near the orphanage in order to build personal relationships with the children living there. In addition to teaching and playing with the children, participants will work on projects such as improving the existing bio-intensive farm and building eco-cottages or other structures at the Tiriji Eco-Center, which provide sustainable revenue streams for IPI. 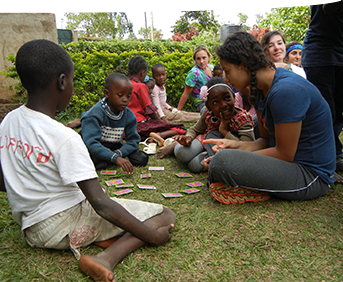 Throughout the project phase, students will also have the opportunity to spend an evening around a campfire with local residents, to participate in a day-long leadership program with Kenya youth, to spend a night with a family in a rural village, and to visit schools and homes with IPI’s community liaisons. Finally, the course concludes with a safari in a world-renowned game park, where students are likely to see a range of animals (giraffes, elephants, zebras, lions, and antelope) as they finish their course in ethical leadership. The mission of International Peace Initiatives is to promote peace by supporting sustainable initiatives that improve livelihoods and enhance quality of life. To learn more, please visit their website. The course elements are based on a rating from 1 to 5, 1 being the least rigorous, 5 being the most rigorous. While at the Amani Children’s Home, the group will work on expanding and improving the facilities at the Tiriji Eco-Center, which is an organic, perma-culture farm as well as a training and retreat center. They will also visit other children’s homes, schools, and community organizations. Prior to their travels, students complete a series of online activities (30 minutes each). While traveling, they also read engaging articles, participate in cultural experiences, and create presentations in small groups. Because a majority of the course occurs in a rural agricultural area, the students will spend an afternoon doing a lengthy walking tour of the village surrounding the children’s home. If the weather allows, another morning will be spent hiking to a nearby waterfall. For a majority of the course, the group will either stay at the Amani Children’s Home or one of the eco-cottages at Tiriji. The last two nights are spent at a wonderful safari lodge. After spending the first couple days on the outskirts of Nairobi, the group will drive for several hours to the county of Meru. After ten days in this area, they will drive for a couple hours to a game park for the safari. Then, on the day of departure, they will drive past Mt. Kenya on their way back to the Nairobi airport. In addition to spending most of their days either at the children’s home or the nearby Tiriji Eco-Center in order to develop relationships with the children, the students will also spend an evening, in pairs, with a rural farming family. After spending the first two days of the course on the outskirts of Nairobi, the remainder of the program occurs in the rural agricultural village of Kithoka or in a Kenyan Wildlife Reserve. People use the phrase ‘life changing experience’ very loosely, but immersion in the community of IPI and Kenya truly has been life changing. I will never forget the people I met and the warmth they all made me feel. Prior to departure, students are guided by their course instructors through a series of interactive, online lessons. Organized by SStS’s Five Lenses Curriculum, these activities (30 minutes per week) allow students to directly engage with other members of the group. The majority of the days at each site are spent engaged in meaningful service work with our NGO (non-governmental organization) partner. Days not dedicated to project work are spent immersed in intriguing cultural activities. During the next school year, students educate others by advocating for our NGO partner through public presentations to the community at large and/or younger, school-based audiences. During the travel phase of each SStS course, students spend time reflecting about the learning that occurs through their immersion and service experiences. These posts capture the impact of our programs on individual students. 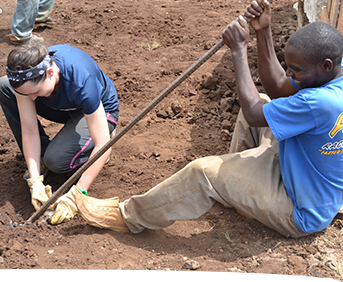 Explore the posts below to learn about the SStS Kenya program from the important viewpoint of our students. Students who attend a school that is a member of SStS’s Global Schools Coalition receive a tuition discount. To see the list of schools in the coalition, click HERE. SStS is in search of curious, compassionate, globally-minded students. Thus, we will do all that we can financially to support students who require assistance. If you would like to be considered for a scholarship, please indicate this on the application. Financial assistance resources are limited. Scholarships tend to be less than 50% of tuition. Please note, tuition does not include airfare, immunizations, and visas for students who are 16, 17, or 18 years old. Tuition costs are all inclusive with the exception of personal expenditures (e.g. souvenirs). Tickets and medical & security evacuation services are purchased as a group. The cost of these services is included in the tuition. Talbot Travel Agency provides travel services for SStS, working personally with us to find the least expensive group fares. As a result, it is not possible to use airline miles or credit card benefits for the international flights. However, these can be used to purchase tickets to the gateway city. Please note that we expect all participants to travel together, adhering to the identical itinerary. We will depart the United States as a group from a gateway city. Exemptions may be made for international students. Additionally, travel in the developing world inevitably includes “the unexpected” (e.g. weather disruptions, transportation strikes, etc.). SStS will adjust the itinerary accordingly, making the best of uncontrollable situations. Due to the unknown variables in international travel, participants are asked not to make travel plans or to enroll in programs that start immediately after their return. SStS is not responsible for expenses incurred due to missed flights if the group is delayed in their return. See where else you can make an impact. View all of the courses we offer.